“Nothing is higher than delight,” says the ancient Book of Formation. All of our desires and musings, our every thought, word, and all we do, all emerge from our sense of pleasure, our obsessive persistence for the most elegant and the most delightful. So too with G‑d’s creation. The essence of each thing—from the tiny atom to a distant galaxy, from the majesty of a mountain peak to the depths of the human heart—is the Creator’s delight in this thing as it plays its tune within the entire symphony of parts. 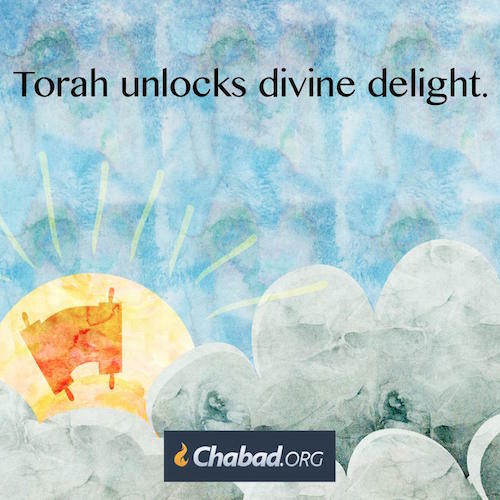 Hidden in the Torah is the key to that delight, the secrets to unlock the purpose and place of each thing. Use something for its purpose, direct it to its seat in the orchestra, and the brilliant glow of the Creator’s delight is redeemed. Sefer Hamaamarim 5696 pp. 8, 18, 21. Likutei Sichot vol. 26, pg. 207. Torat Menachem 5745 vol.4, pg. 2527.